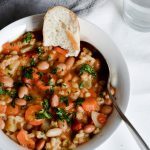 A soup perfect for dinner! Place barley in a sieve and rinse under water. Transfer to a bowl, cover with 480ml (2 cups) water and let soak for 30 minutes. Meanwhile prepare all the vegetables. In a large pot (I use a 4 quart round Staub cocotte) heat olive oil over high heat. Add onions and cook until tender, a few minutes (some browning is okay). Add the garlic and cook for another 30 seconds, just until aromatic, then toss in the potatoes, carrots, leeks, celery, parsley and salt. Stir the vegetables a few times and cook for about a minute, until the leeks get wilted a bit. Add the soaked barley along with the water, diced tomatoes and 3 cups vegetable stock. Stir until evenly distributed over the pot. Make sure all potatoes are submerged (if any are peeking out push them in with a spatula/spoon). Cover pot with lid and bring to a boil, then lower heat to medium-high and cook, covered, for about 40-50 minutes, until the potatoes are soft and barley tender. Stir soup occasionally as it cooks and check to see if it’s simmering. Remove from heat and fold in the beans. Taste to see if the soup needs more salt or pepper. Sprinkle with some parsley (optional) and serve. If the soup is too thick for your liking simply add more water or stock in the end and put it back on the stove just until it starts to simmer. Instead of using canned beans, you can cook beans at home. Personally, I would cook beans separately and not with the soup, because the saucepan is crowded enough as it is. If you’re making this in a very large stockpot then you can try cooking the beans along with the rest of the vegetables.